I'm a big Kashi fan (the TLC Trail Mix bars are my FAVORITE) so I am always tickled when they have a free sample offer. Right now they urge you to have your kids take the 2-bite test and help your kids enjoy eating better in just two bites. 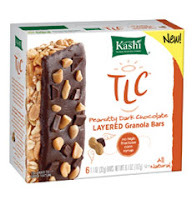 You can choose from a FREE sample of Kashi TLC Peanutty Dark Chocolate Layered Granola Bars or Kashi Cinnamon Harvest Cereal. Those granola bars look awesome!